VFL: Round 16 in 60 seconds Watch highlights and key moments from the VFL side's 32-point win over Werribee at the Docklands on Saturday. 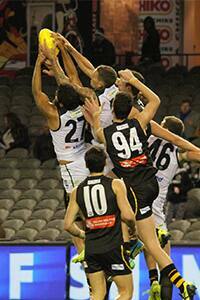 Kayle Kirby flies for a pack mark against Werribee at Etihad Stadium. Photo: Shane Barrie. There are three names that Collingwood fans should start getting themselves well acquainted with. And Josh Daicos completes the hat trick. In Collingwood’s VFL victory over Werribee on Saturday, it was this young core that shone under the bright lights of Etihad Stadium. And it almost seemed as if the stage was set for the 18-year-old forward from Lake Boga to put on a show. And he didn’t go off script. In fact, he brought his own. His five-goal haul – which included a highlight reel showcasing the very best of his electric speed and aerial abilities – guided the Magpies to an important victory with only three rounds remaining. “Kayle has had a sensational year,” Academy coach Brad Gotch told Collingwood Media post-game. “He still has so much to learn, but we know that’s going to happen as he works his way through the system a little bit longer. “We’ve started to work out how to kick to his advantage. He has the speed, he knows how to take a high mark and he’ll fight for it at ground level. Kirby’s five goals extends his lead in the VFL’s goal kicking race, with his season total of 38 majors leading Port Melbourne’s Dylan Conway (32 goals) and Richmond’s Ben Lennon (31 goals). Kirby celebrates one of his five goals against Werribee at Etihad Stadium. Photo: Shane Barrie. With the Magpies’ finals hopes on the line, the Jared Rivers-led Pies overpowered the Werribee Tigers in the second half, kicking eight goals to four. “We probably started a little bit scratchy, but we found our way as the game went on,” Gotch explained. “We lost a couple of players during the game – with Chris Mayne being held as the carry-over for the seniors and Henry Schade going down with a hamstring – so to be able to run the over top of them in the final term was very pleasing. “For him to come out and show that composure, work hard and be clean around the ball, it’s a pleasing sign. Brown tackles Werribee's Jed Anderson on Saturday afternoon. Photo: Shane Barrie. “Out on the wing and playing forward, he’s showed good signs for the future. “And to come off that foot injury (last week against Essendon) and impact the game the way he did, that’s what we want to see. Jesse White played a variety of roles for the VFL Pies against Werribee. Photo: Shane Barrie. “If you look at the third quarter, he had such a big impact as far as getting the contested possession and his clearance work. “We’ve challenged him to show us the grunt and toughness in the middle; to use the ball under pressure – which we he has the class to do – and he did that exceptionally well. The VFL Magpies meet North Ballarat at Victoria Park, next Sunday from 1pm.